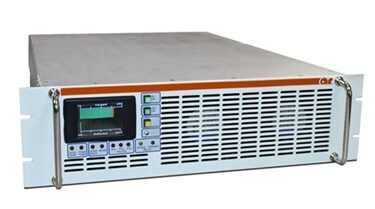 AR Modular RF has completed production on 80 units of its Model KAW5050 amplifier for a base station application. The KAW5050 is a Class AB wideband RF power amplifier system delivering up to 1000 Watts PEP power into a 50-ohm load over the frequency range of 225 MHz to 400 MHz. This new custom system comprises a Power Amplifier, controller sub-system and AC Power Supply Unit encased in a 3 RU shelf. The system weighs 50 pounds and mounts into a standard, 19-inch equipment rack. The new amplifier is being used in a base station application and can be operated and monitored remotely via RS232 or Ethernet control. Replacing a legacy two-shelf, 500 Watt, 225- 400 MHz, 115 pound -rack mount system, the new configuration utilizes updated components and design techniques for a lighter, more powerful, more efficient system. AR Competitive Edge products supply a multitude of unique RF solutions to companies around the world. The company's limitless support network reaches the far corners of the globe. AR products are backed by the company's "Competitive Edge" warranty, the best and most comprehensive warranty in the industry. When companies purchase from any AR company they have the peace of mind that comes from knowing the global leader will be there to help with any problems today, tomorrow and always. For more information visit www.arworld.us.